"David Stockert has spent over 21 year in sales and promotion for the travel industry. 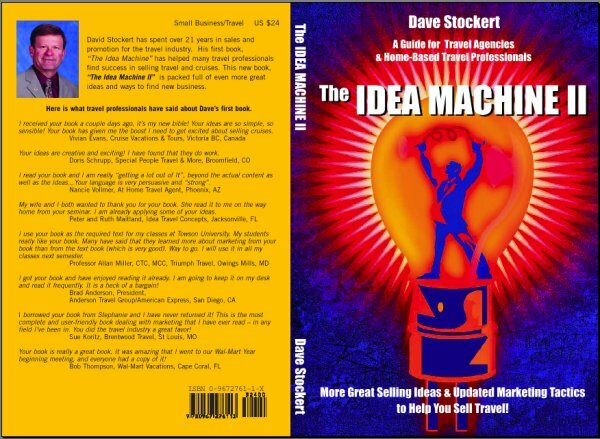 His first book, The Idea machine has helped many travel professionals find success in selling travel and cruises. This new book, The Idea Machine II is packed full of even more great ideas and ways to find new business." Here is what travel professionals have said about Dave’s first book. "I received your book a couple days ago, it’s my new bible! Your ideas are so simple, so sensible! Your book has given me the boost I need to get excited about selling cruises." "Your ideas are creative and exciting! I have found that they do work." "I read your book and I am really “getting a lot out of It”, beyond the actual content as well as the ideas… Your language is very persuasive and “strong”." "My wife and I both wanted to thank you for your book. She read it to me on the way home from your seminar. I am already applying some of your ideas." "I use your book as the required text for my classes at Towson University. My students really like your book. Many have said that they learned more about marketing from your book than from the text book (which is very good). Way to go. I will use it in all my classes next semester." "I got your book and have enjoyed reading it already. I am going to keep it on my desk and read it frequently. It is a heck of a bargain!" "I borrowed your book from Stephanie and I have never returned it! This is the most complete and user-friendly book dealing with marketing that I have ever read – in any field I’ve been in. You did the travel industry a great favor!"